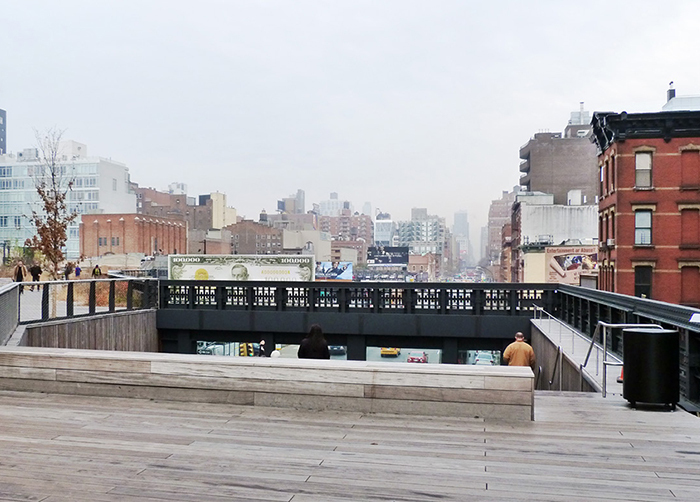 Since its debut in 2009, the ever-trendy High Line has become the new “it” girl of urban architecture, coining the term “the High Line effect.” And with good reason. With its great economic success, global publicity, and its positive contribution to city life, the High Line is a tempting model to replicate, especially when there are eager candidates of outdated and tired infrastructure slated for demolition all across the nation. As a public park built on the historic freight rail line elevated above the streets on Manhattan’s West Side, the High Line has literally made something out of nothing. Therefore, the arithmetic seems simple—abandoned infrastructure + urban setting + renovation + landscape = instant success! The problem is that the reduction of the High Line to words like “renovated,” “abandoned,” and “urban” negates the extreme site specificity that gives the elevated park its unique character. Or more precisely, it fails to include the high density and rich history of the city that profoundly influenced its success. Witold Rybczynski, Professor of Urbanism at the University of Pennsylvania, aptly states, “the High Line may be a landscaping project, but a good part of its success is due to its architectural setting, which… is crowded with interesting old and new buildings. The park courses through the meatpacking district, and Chelsea— heavily populated, high-energy residential neighborhoods. Very few American cities — and Manhattan is the densest urban area in the country — can offer the same combination of history and density.” Therefore, the High Line is a very unique case in our American landscape. 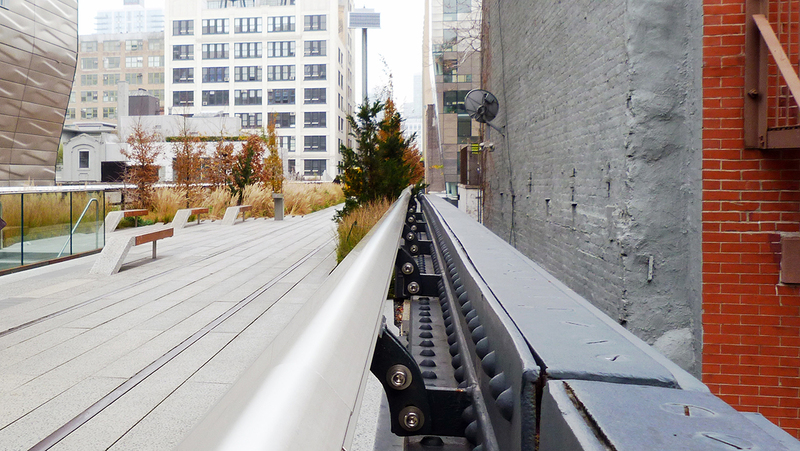 The Highline touches down into the urban fabric of New York City's streets. 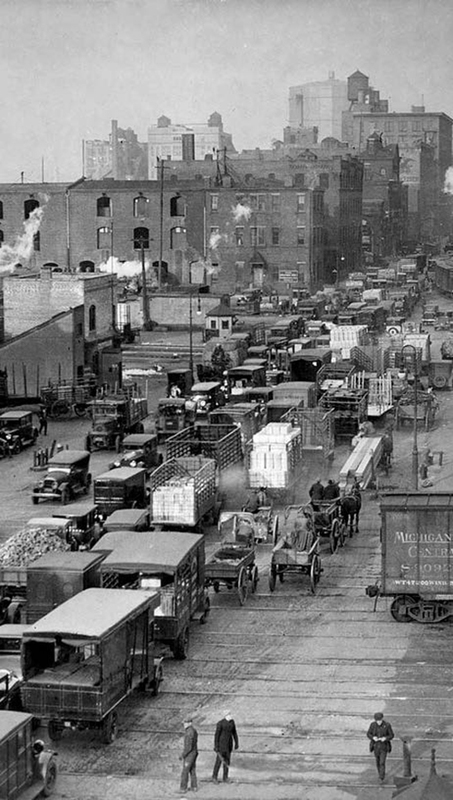 A photo of Death Avenue before the current infrastructure of the High Line was constructed. Between the years of 1846 and 1941, on the west side of Manhattan, there were a series of street-level train tracks designed to deliver varying goods like dairy and meat to freight terminals on streets like Hudson, Beach and Chambers. Due to the irregular train route, the train coincided with much of the pedestrian crossing. Inevitably, there were deaths; so many that the route earned its name Death Avenue (which later became immortalized in the High Line’s homage to the avenue with the 10th Avenue overlook). Different solutions, protests and warnings came thereafter: one where the train would follow a man on horseback with a red flag at 6mph warning oncoming traffic, and another where the sinking of tracks to create a physical hierarchy helped to reduce the number of deaths. By 1908, it was reported that in the course of 56 years, the line had killed 436 people. 198 of those deaths occurred in the decade prior - the majority of them children. As a city freight train the High Line was in use until the 1970s when the development of the interstate system grew popular and rendered it obsolete. Two decades later, the city had demolished its southern most section, from 34th street to the Holland Tunnel, leaving the remainder of the carcass up for demolition. Fortunately, a few neighbors of the abandoned railway banded together in a citywide collaboration to rescue it from that fate. By 2009, the red ribbon was cut and the High Line was officially declared open. 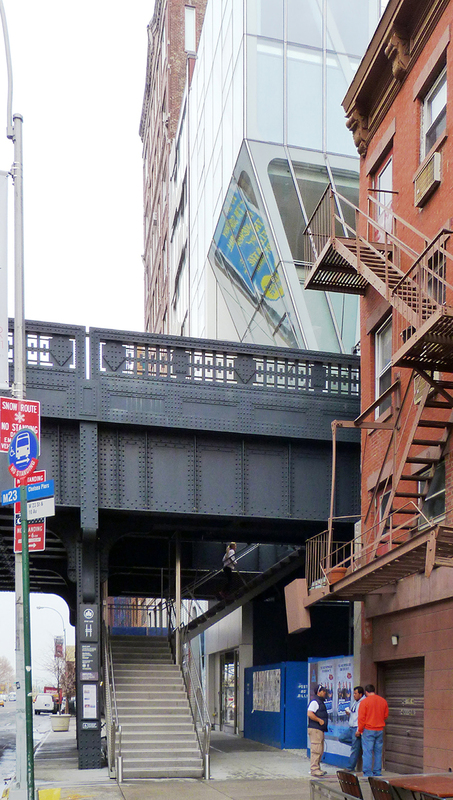 The history of industrial materiality of the High Line can be seen in the details. 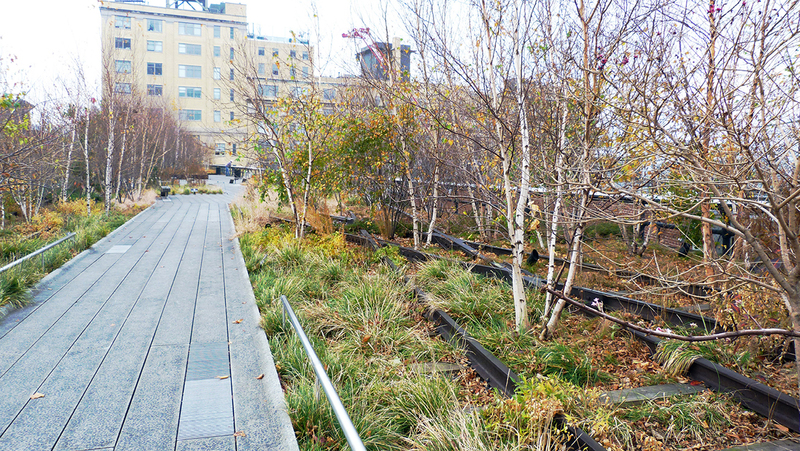 WHY THE HIGH LINE WORKS? 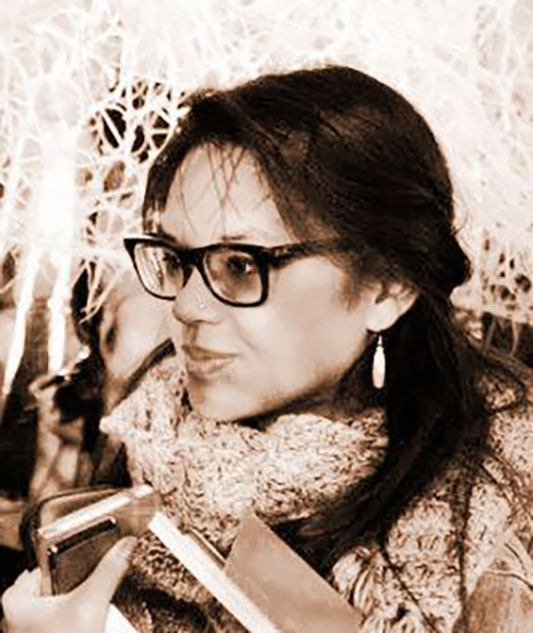 Undoubtedly, the cultural, economic, and environmental history of the city inspired a good deal of the designs and installations occurring in the High Line. Artist Spencer Finch’s The River that Flows Both Ways is an art installation at the Chelsea Market passage that retells the journey of the Hudson River through a succession of varied colored pixel window panels. While it speaks a poetic language about the imprints of the Hudson River with New York’s Industrial past, it also plays upon New York’s current geographical identity. This installation captures and refracts the light and colors of the New York skyline, which reestablishes the success of the High Line as an accumulation of individual episodes that illustrate present day and past day New York City. Case in point, the High Line is a subliminal retelling of New York’s past through embodied experience. Beyond its historical roots, though, the High Line engages city dwellers in an active conversation about its saturation burgeoning development. Averaging around 25ft above street level, the additional height clarifies scale in the skyscraper filled city that cannot be understood at ground level. Most New York streets are overcrowded and lack adequate amounts of public space. Indirectly, this creates a culture of fast-paced tunnel-visionedNew Yorkers. Typically, “the maximum volume for comfortable pedestrian movement is 12 people per minute per yard of sidewalk width. Anything above this level is considered to be overcrowding.” InNew York, with a population of 8.34 million, it is not hard to imagine over-congestion on city streets It’s no wonder that the majority of energy spent in streetwalking in New York is spent navigating the immediate visual radius. Which comes at a cost: desensitization (and therefore disengagement) to a changing built urban environment. But from the vantage points of an elevated pathway, people become purveyors of the city. Awareness to any physical change of the city (construction, demolition, renovation) is intensified by the sheer fact that the High Line is elevated and at center stage with an epic backdrop of icons like the Statue of Liberty, Hudson River, and Jersey Skyline. 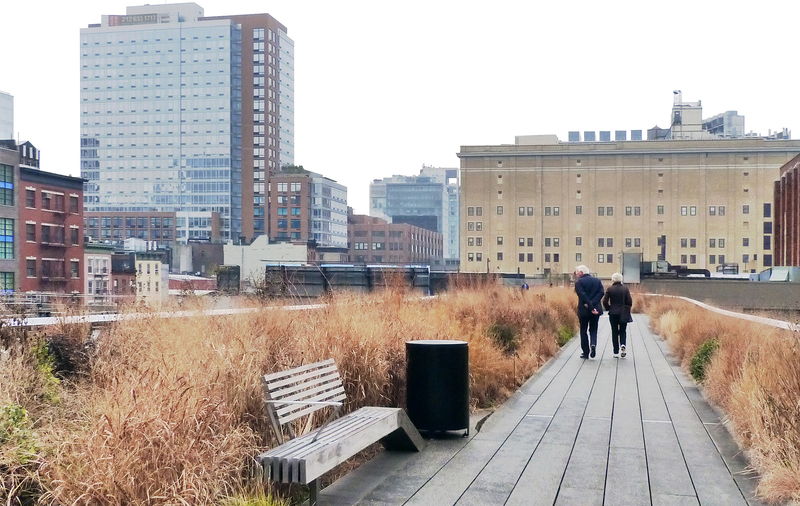 The level of individual engagement with the built environment that the High Line provokes is important, because it integrates, rather than segregates, the city and its inhabitants into a holistic entity. 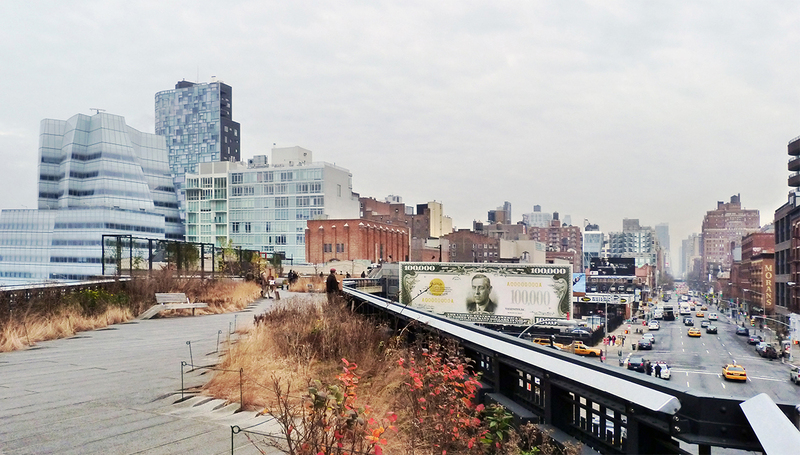 The High Line crosses many of Manhattan's streets and creates experiential places, blending landscape and space. Yet, while the role of the High Line as an elevated storyteller and city purveyor is an element that brings character and “renewed magic” to the abandoned railway, it still does not fully depict the High Line as a resource, context-based manifestation. In fact, a similar pattern occurred 150 years ago with Central Park when cities tried to replicate the larger than life park. During the 1860s, at the wake of the first efforts of the Golden Gate Park, Olmstead devised a report for the city of San Francisco. In it, he had advised “against the replication of Central Park on the north coast of California, because of its arid climate.” This was interesting because Olmsted was ultimately commenting on the “Monkey-See, Monkey-Do” phenomenon of which many cities are guilty. More harm than good could result in the failure to acknowledge an urban framework when replicating other urban models. Take for instance Calgary and Minneapolis. During the 1960s and 1970s, after the large success of Hong Kong’s own elevated pedestrian walkways (pedways), Minneapolis and Calgary had both installed enclosed elevated networks in their downtown areas (8 miles and 9 miles respectively). Theoretically, it was a sensible solution. In Le Corbusieur’s Voision Plan (1925), Corbusier had called for a better quality of life by the separation of vehicular and pedestrian movement. This meant that a continuous flow of movement could be maintained while other tasks could be performed seamlessly. However, while succeeding in Hong Kong, the plan had failed in the North American cities. This is important because there was a difference in context for all three cities. While Hong Kong’s main motive for elevated pedways was to find a solution for the already overcrowded street life, the North American cities were implementing the same plan as car emergent cities. Fundamentally, they lacked the density to sustain the elevated pedways. With a population of only 370,951 spanning over 58.4 square miles, Minneapolis’s downtown was decentralized and a slew of abandoned, empty lots materialized out of the construction of the 8 miles long elevated pedestrian walkway. The same analysis can be given for Calgary. Conversely, New York City has a very dense street life. In a report for the City of New York in 2007, Jan Gehl Architects characterized New York City streets as heavily used and inadequate for the level of existing traffic flow, littered with obstacles like food trucks, scaffolding, and newsstands. Unlike what occurred in both Minneapolis and Calgary, New York City has the number count that requires an interruption of traffic flow. Located in a fast paced city, the High Line can tackle the straitjacket density through a movement-focused program. But the difference between typical street movement in New York City and the High Line is that while the movement is dictated in the High Line, function is not. Littered across the pathway are the expansions and contractions of public, private, and semi-private spaces that have the capacity to slow down pace to an experiential level that is uncommon in the big city. As Jane Jacobs once said, “a good city street neighborhood achieves a marvel of balance between its people’s determination to have essential privacy and their simultaneous wishes for differing degrees of contact, enjoyment, or help from the people around. The Reading Viaduct. Rendering by Studio Bryan Hanes. At first glance, the High Line has accomplished a slew of modern day feats, and it is hard to look at without a little envy. As a harbinger of large economic success, a successful practitioner of sustainable efforts, properly nesting itself as both a tourist and local attraction, and its generative ability to transform a city, there is great incentive to understand how and why it works. 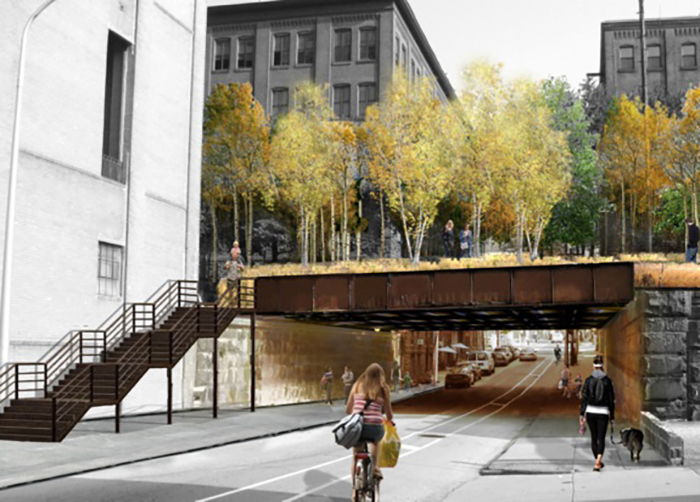 Much like the Bilbao Effect, the High Line has created its own set of ripples across the nation with projects like the Philadelphia Reading Viaduct, and the Chicago Bloomingdale Trail. In the late 1800’s, Chicago deployed a partial master plan by Burnham and Root that pushed green spaces to the outer borders of the city. As such, Chicago lacks a significant amount of green public spaces- Logan Square, one ofthen neighborhoods in West Chicago where the Bloomingdale Trail intersects, is noted as a neighborhood that has the least amount of green spaces available to its residents—a telling reason as to why a renovated abandoned viaduct might be a good idea for the city. But unlike New York City, Chicago lacks the kind of private fundraising momentum that a city like New York is able to cultivate. As such, majority of the Trail’s emphasis has been to encourage community involvement. With its large earthen embankments, 17 bridges, shorter average elevated height than the High Line, and intersections within four west Chicago neighborhoods, the Trail does not project the same sensation the High Line has cultivated. Instead, it focuses on more grassroots oriented local attraction, such as full accessibility to both pedestrians and cyclists. This is a telling reality for much of the abandoned infrastructure slated for renovation: the High Line is a costly endeavor. In Philadelphia, Paul Levy, the president of the Center City District, succinctly states, “what we want to do is build the first phase, like New York, and have people say they love it and want to do the rest. We do not need the Mercedes- Benz that they built in New York.” However, while the High Line might be costly, the idea of the renovation of dying infrastructural giants might be a cheaper and feasible option than complete demolition. 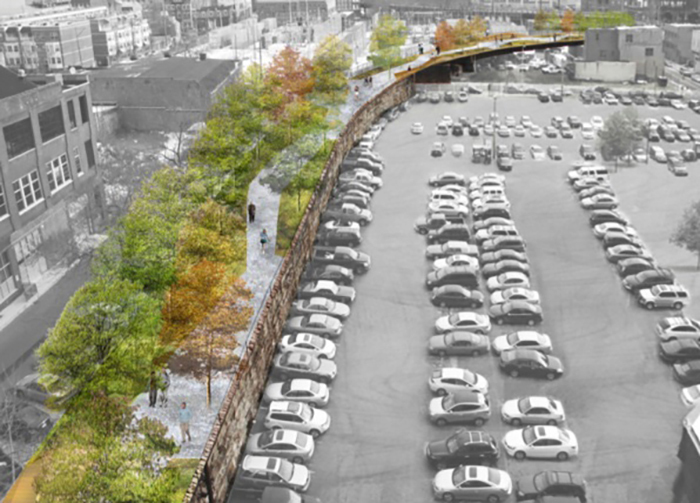 It’s estimated that the Reading Viaduct in Philadelphia would cost $50 million to tear down, but $36 million for a retrofit. A significant difference when a project like the Reading Viaduct has the potential to create a unique, mixed-income neighborhood representative of Center City and the adjacent Chinatown neighborhood. And therein lies the High Line Effect: beyond economic, social, and environmental success, the High Line’s greatest contribution was its ability to inspire other cities to capitalize upon their respective unique characteristics to strength and transform city life. 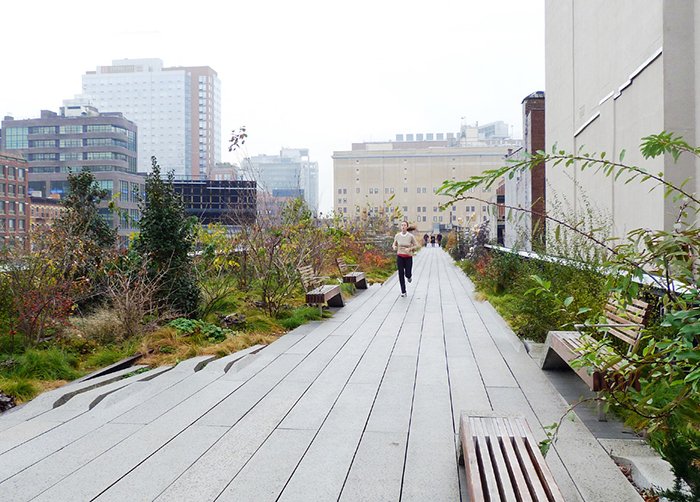 Since it’s opening, approximately 4 million tourists visit the High Line every year. Twenty-nine new projects have been built or are underway in the area, and according to the New York City Department of City Planning, there are about 2,500 new residential units, 1,000 added hotel rooms, and an increase of offices, and gallery spaces lining the elevated park. And if that wasn’t enough, the third section of the High Line is to be completed this year. The impetus for redevelopment is great, so it is no surprise that other cities are beginning to propose their own versions of the elevated park. As construction is set to begin on the Atlanta Belt line in Georgia and the Chicago Bloomingdale Trail, cities are in continuous conversation on how to use the High Line as a model for future designs. The High Line was consummated through a very specific constellation of people, financial resources, politics, market forces, geography and culture that make it irreplaceably unique. As such, it serves as an example of how cities can creatively reframe their respective public spaces specific to their urban contexts.